The EarthBound universe (MOTHER, Mother, see below) refers to the Super Smash Bros. series' collection of characters, stages, and properties that hail from Nintendo's cult-classic trilogy of Japanese role-playing games titled EarthBound (Mother in Japan). The second game of the series, EarthBound, stars Ness, a child who was granted special psychic powers, while the third game in the series, Mother 3, stars Lucas, who similarly was granted psychic powers. The series was created by Shigesato Itoi, and the franchise's symbol is the Earth, which itself is a recurring motif in the EarthBound series (being represented in both Earthbound and Super Smash Bros. by the Blue Marble). An influential Japanese copywriter, actor, and television personality named Shigesato Itoi took a foray into the Nintendo-dominated video game market of the late 1980s despite some initial skepticism from Nintendo’s higher-ups about working with celebrities. He and then-Nintendo president Hiroshi Yamauchi formed a new subsidiary called Ape Inc. (later rebranded as Creatures) and Itoi designed and directed the Japan-exclusive RPG Mother. Released for the Famicom in July 1989, it was an unconventional take on the primarily sword-and-sorcery-themed RPG genre. The game was set in a humorous rendition of contemporary America, had the player assuming the role of a neighborhood boy with psychic powers, featured conventional objects such as baseball bats and yo-yos as stand-ins for weapons that could be equipped, and featured a variety of bizarre and comical enemies such as possessed automobiles, crazed animals, and hippies and gang members. It also featured a very odd blend of simplistic character designs and dark and brooding themes and undertones. The game sold very well in Japan, and an English localization immediately began, with an intended for a fall 1991 release date and with Earth Bound as the intended Western title. However, marketing executives anticipating the mid-1991 release of the Super NES decided that the prototype NES game would be too expensive to produce and market, and the localized product was shelved with no foreseeable plans for a future release. Itoi returned to design a sequel for the Super Famicom, Mother 2, though the title's development was troubled by a new inexperienced development staff and stretched across five years, nearly facing cancellation. That was, until veteran programmer Satoru Iwata joined the development team, making the Mother 2 project now a joint effort by Ape and HAL Laboratory (HALKEN at the time), separate studios based at separate locations (employees would regularly have to travel between studios to work). It was released in August 1994 in Japan and, unlike its predecessor, actually saw a Western localization the following June, under the first public occurrence of the name EarthBound. However, while the game's Japanese sales figures were relatively close to the original's, it sold poorly in the West because of an unusual and ineffective marketing campaign and that American audiences were largely indifferent to JRPGs at the time (this would only end with the 1997 release of Final Fantasy VII, which brought the genre to the mainstream). These poor sales even prevented the game from being released in the PAL regions. Critical retrospectives, however, portray it as not only one of the best RPGs in the 1990s, but also one of the most original, both in its approach to established JRPG mechanics and in its uniquely quirky humor, storyline (which is comparatively more light-hearted than its forerunner), character, and bizarre psychedelic aesthetic, as well as its many parodies of American culture and JRPG - and science fiction - storytelling conventions. Some publications have named it the defining example of a cult classic, with substantial fanbases in both Japan and North America. More development and release-date woes awaited the Mother franchise following EarthBound. Itoi immediately began development of the series's second sequel for the Super Famicom in 1994, which was then moved to the Nintendo 64DD add-on for the Nintendo 64, popularized by the media as the then-upcoming EarthBound 64. When the ill-fated disk drive peripheral was met with commercial failure, the game was cancelled and restarted its development cycle on the Nintendo 64 itself, where it was initially expected to be a launch title for the console's Western release. But Itoi's development team was inexperienced with developing three-dimensional titles and the Nintendo 64 hardware itself, and the project remained unreleased even as EarthBound was included by Masahiro Sakurai as a surprise contending franchise in the Super Smash Bros. crossover fighting game. Itoi eventually announced the official cancellation of EarthBound 64 in August 2000, citing that he did not want to make anything other than "something truly special" in addition to the project becoming too complex with its interest in three-dimensional graphics. Shigeru Miyamoto subsequently became interested in finding ways to salvage some of the work, though this had to be put on hold because the Mother 3 development team was put on Nintendo GameCube projects. Meanwhile, the translated prototype of the Western version of the NES game was discovered and purchased by a fan translation group, which was modified, retitled "EarthBound Zero", and distributed through the Internet as a ROM image. Itoi eventually decided to rerelease both EarthBound games in Japan as ports compiled on one Game Boy Advance cartridge, Mother 1 + 2, which was released in June 2003 in Japan and included all of the enhancements the English prototype had made to the original Mother; to the dismay of fans, this was never released in the West either. However, Itoi realized he would once again be pressured into reviving Mother 3, an idea he was initially opposed to, but encouragement from fans led to his decision to restart development for the game for Game Boy Advance, which he approached as though he were developing his magnum opus. Mother 3, essentially now a Game Boy Advance recreation of EarthBound 64, was finally released in Japan in April 2006, twelve years after development began and over a year after the launch of the Nintendo DS successor portable. This Game Boy Advance title returned the series to a two-dimensional formula, but had kept the game's story largely intact and unique enough to distinguish it from past entries. It was released to critical acclaim that praised its new rhythm-based but otherwise simple approach to turn-based RPG combat, and most significantly, tragic storytelling and characterization that achieved a rarely seen degree of depth in titles in the genre. Unfortunately, Nintendo of America would once more decline to localize the game for Western audiences, once again apparently because of fears that its inconvenient timing at the end of the commercial lifespan of the platform it was based on would negatively affect its sales. The fansite Starmen.net made headlines in October 2008 when it released its own English translation patch that could be applied to a copy of the ROM image of Mother 3, and the patch received over 100,000 downloads from the website in the first week of its release. Despite the project not being completely legal, it became one of few unofficial video game localization projects that officials in the video game industry did not formally object to and expressed admiration for. In the meantime, the Mother series has regularly appeared in every subsequent Super Smash Bros. game to date, including Mother 3 being focused on in 2008's Super Smash Bros. Brawl, though Itoi has announced that he has no plans to direct a fourth Mother game and reaffirmed this statement several times. Eventually in July of 2013, Nintendo released EarthBound on the Wii U Virtual Console in all Western regions, nearly two decades after its initial release for Japan and North America only. Critical reception was strongly positive of this rerelease and EarthBound continuously topped the charts of most downloaded games on the Wii U’s Virtual Console lifespan. Within a few years, EarthBound would also be rereleased on the New Nintendo 3DS Virtual Console and the SNES Classic microconsole. Later on, in June 2015, Nintendo released the original Mother (entitled EarthBound Beginnings) for the first time in an official English release to commemorate its sequel's 20th anniversary overseas. Finally, Mother 3 was announced in a Japan-only November 2015 Nintendo Direct to be on the Wii U Virtual Console by mid-December in conjunction with the Japanese release of the Lucas amiibo, though this release is exclusively in Japan. This makes Mother 3 the only game in the series to not have an international release on the Virtual Console as well as during its initial launch. Mother 2 / EarthBound: In the 1990s, a 13-year-old resident of the fictional country Eagleland, Ness, is told by a tiny bee-like alien from the future, Buzz Buzz, that a hostile alien named Giygas is fated to dominate the universe in the future, and Ness must go on a quest to visit eight sanctuaries to unite his own powers with the Earth and gain the strength required to confront Giygas in the past. But along the way, Ness is repeatedly harried by his obnoxious next-door neighbor, Porky Minch (rendered as "Pokey Minch" in EarthBound), who is eventually revealed to have become Giygas' right-hand man and a willing believer that the universe should be destroyed. Ness and his friends' infamously disturbing final battle against Giygas - who has long since been driven incoherent and physically rendered into a visually frightening, gaseous form by his own boundless power - comes to demonstrate that Ness' quest to hone his power is insufficient to win (referencing a theme of the previous game that "brute force is not enough"), and so the heroes can only fall back on praying for spiritual help from everyone they know (and some they don't). Mother 3: In an unknown time period long after the events of EarthBound, a resident of a rural egalitarian village in the Nowhere Islands, Lucas, and his father Flint, tragically lose his mother, Hinawa, and his brother, Claus, had gone missing as a result of the arrival of an army of mysterious pig-masked soldiers. In a story told from multiple perspectives, Lucas is eventually thrust into a quest to pull out seven special needles spread out across the island before the Pigmasks and their mysterious masked field commander can do the same, for the world would be destroyed if the needles are pulled by those of evil intentions. It is eventually revealed that the "King" of the Pigmasks and author of the plot to have the masked man destroy the world is Porky Minch, having traveled in time to the present and having been rendered immortal by the effects of time traveling. Lucas's quest ends at the capital of Porky's invasive, hedonistic, and industrious society on the Nowhere Islands, New Pork City, where he fights both Porky in his last stand and the masked man himself, who turns out to be none other than a brainwashed Claus, in front of the final needle. EarthBound is one of the "bonus franchises" in the original Super Smash Bros., for it contributes one unlockable character, and a song (his victory theme). There are no stages based on EarthBound in the game, so Ness instead has to be fought on Kirby's stage in order to be unlocked. Ness: A boy living in the town of Onett, Ness is gifted with psychic powers. He is chosen by a little alien named Buzz Buzz to save the world from Giygas, a malevolent entity which is causing the citizens and animals of his town and others to become hostile. To do this, he must first travel to eight sanctuaries and record the Eight Melodies in his Sound Stone (given to him by Buzz Buzz), then he must combine those melodies and make the "Sound Stone Melody", which will give him the power of the Earth necessary to defeat Giygas at the end of the game. (The second half of the melody comprise Ness' fanfare in the Smash series.) All of Ness's special moves (PSI Magnet, PK Fire, and PK Thunder) were used by Paula, not Ness, in EarthBound. Ness is currently in bottom tier, sitting at 10th out of 12 on the tier list. 24: The victory fanfare of Ness is an orchestrated version of the last several notes of the Eight Melodies (not to be confused with the separate Eight Melodies from its predecessor, Mother) that Ness collects throughout his journey at the eight "Your Sanctuary" spots in EarthBound. This incarnation of the Eight Melodies also appears in EarthBound as part of "Smiles and Tears", which also appears in remixed form in Super Smash Bros. for Nintendo 3DS and Wii U.
EarthBound is a franchise whose representation in the Smash series was expanded upon in Super Smash Bros. Melee, with one character, two new stages, a new item, and many new trophies. Lucas was supposed to replace Ness in Melee but, due to the cancellation of EarthBound 64, Ness was kept in at the last minute. Ness: Ness is still the only playable EarthBound character in the game, but with a new PK Flash chargeable attack as his new B move. As a result, his previous B move, PK Fire has been moved to his Side B. Despite his flaws in Super Smash Bros. like his recovery, Ness has suffered a nerf overall, countering most of his buffs & is currently ranked 23rd out of 26 in the tier list, similar to his Smash 64 tier placement. Melee is the first game to introduce stages for the EarthBound series. Eagleland: Onett: The quaint suburban hometown of Ness, its citizens and animals become hostile under Giygas' otherwise invisible influence. The red spherical meteor on the hilltop in the background is the alien Buzz Buzz's spacecraft and, when Ness investigates it, he is instructed by Buzz Buzz to go on a quest to save Onett and the world from Giygas' influence. This stage takes place on and around houses and a drug store whose balconies serve as battling platforms. The road in front of the characters on the ground has speeding cars on it, and cars zooming past characters on the ground will almost definitely KO them. Eagleland: Fourside: The New York City-inspired urban metropolis in EarthBound manifests as a battle-on-skyscrapers-in-the-nighttime stage for Melee, and it can be said that this is the spiritual successor to the Saffron City Pokémon stage from the first Super Smash Bros. The layout of the stage allows for bottomless pits in between buildings, so this is the most conceivable stage where the Wall jump technique can be used to save oneself from a fall. In addition, from time to time a UFO piloted by a henchman of Giygas called a Starman (not to be confused with the Mario powerup of the same name) will materialize above the city and serve as an extremely slippery platform. This stage is banned by many tournament legal standards. Mr. Saturn: A race of odd little creatures with big noses, whiskers, and the ability to talk, Mr. Saturns are encountered as friendly NPCs by Ness in EarthBound. They make their home in an area of Eagleland called Saturn Valley, and when they speak the text in the game is presented as hard-to-read kindergarten scrawl, and they often mix the words "boing", "ding", and "zoom" into their speech for unknown reasons. As a Melee item, a Mr. Saturn is an intentional "dud" item. It walks around on its own, and it can be picked up and hurled at opponents for minor damage, but it can be reused this way because it does not disappear after one use. In addition, a thrown Mr. Saturn does 21 shield damage in this game, and several bonuses are available based on the usage of these creatures. 19: Mother: Despite being known as "Onett" after Melee, it is not actually heard in EarthBound for SNES, which is the origin of the town of Onett. It is actually a combination of three tracks from the original Mother for Famicom, the first track being the song Bein' Friends, the overworld and town song that plays when Ninten (the main protagonist of Mother) has at least one other character in his party, the second being the Eight Melodies that Ninten collects throughout the game, and the third being a clip from the title theme (which would later be the shared victory theme for Ness and Lucas in the third Super Smash Bros.). The music also ends with an enemy encounter tune, which appears in both Mother and EarthBound (albeit only for bosses in the latter). It is heard in Onett. 20: EarthBound: Synthesized music heard prominently in EarthBound, this is the official theme for the city of Fourside in both the game and in Melee's Fourside stage, with the first half of EarthBound's Eight Melodies inserted at a point (the last several notes of the original version, incidentally, are used as Ness's victory fanfare). 35: Mother 2: The song's real title is Pollyanna. This quaint soft rock is a remix of a track first heard in the original Mother as the typical overworld music that plays when Ninten is the only character in his own party. A remix also appeared in EarthBound whenever Ness returns to his house during his quest, with the intro to the original version also being used in that game in Onett when the sun rises. It also appeared in Mother 3. It is heard as a secondary track on Onett. 47: Ness's Victory: The victory fanfare of Ness is an orchestrated version of the last several notes of the Eight Melodies that Ness collects throughout his journey. 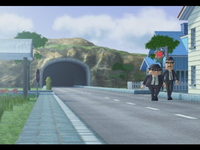 Two members of the Runaway Five appear in the introduction movie in Onett. There is also a sign showing a picture of the same two people that may have been planned for a beta version of the stage. In the retail version of Melee it is replaced with a different sign and moved further to the right of the stage. Sound effects from EarthBound can be heard in the beginning of the Special Movie. The content from the EarthBound franchise have been given a major representation since Melee with two total playable characters and another item in Super Smash Bros. Brawl. Ness: The protagonist of EarthBound was confirmed to be returning in Super Smash Bros. Brawl by the opening sequence of the game and by the official Dojo on February 1st, 2008. He has been slightly buffed from Melee while still retaining his old moveset and voice clips. He gained an additional 10 frames of lag when grab released, making him extremely vulnerable to infinite grab-release follow-ups. Thus his tier placing is currently 26th, being a mid-tier character rather than a bottom tier character in Melee. Lucas: The protagonist of Mother 3 and the most recent hero of the series is a newcomer to Brawl. Although his special moves are similar to Ness's, Lucas's standard moveset is largely different. Some similar moves between the characters differ in function, i.e. whereas Ness would have an attack that deals one solid hit, Lucas has one that deals multiple small ones and vice-versa. One of Lucas's alternate costumes makes him look like his twin brother from Mother 3, Claus. He is currently ranked 30th on the tier list, being lower than Ness and also the lowest of the newcomers in Brawl and at the very bottom of the lower-mid-tier. He shares the same problem with Ness, having an additional 10 frames of his grab-release animation that leaves him prone to grab-release follow-ups. On the final character select screen (after all characters are unlocked), the EarthBound characters occupy the eighth column alongside the Fire Emblem characters (both of these series were originally Japan-only RPG series that later saw at least one entry released in the West). Porky Minch: Porky appears as a boss in Brawl's Subspace Emissary mode. Porky's supposedly robotic statue form chases Lucas around The Ruined Zoo. Ness retaliates against the giant statue and uses a PK Flash to destroy it. When the statue crumbles, a mechanized spider-looking machine appears with the body of Porky in the center. Jeff Andonuts: Jeff uses his bottle rocket launcher and launches homing missiles at all opposing characters. New Pork City: An enormous stage akin to Melee’s Temple stage. Based on the locale from the Japan-only Mother 3, a beast known as the Ultimate Chimera makes an appearance here. Melee Stages: Onett: One of the stages that returns from the previous game, it only has a few minor differences such as a the addition of My Music, as well as the knockback from the cars having been significantly lowered. Mr. Saturn: Mr. Saturn is mostly unchanged from his Melee appearance: minimal damage when thrown, but now does 43 shield damage, one more than twice as much its Melee shield damage of 21. Franklin Badge: This equip-able item from Mother and EarthBound is an item in Brawl. 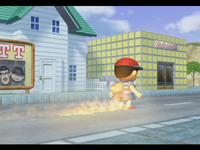 In Mother, it could reflect the Gamma-level PK Beam attack, while in EarthBound, it reflects electricity-based attacks back at the attacker; in Brawl, it is worn by a character for a short while, making him or her immune to all projectile-based attacks which get reflected back in the direction whence it came. Porky's Theme - The theme of Porky, main villain of Mother 3, and his Pig Mask Army. This remix is taken directly from the Mother 3i soundtrack (with the Log-O-Type part of the song taken from another remix in the Mother 3i soundtrack). It is used on the New Pork City stage. Unfounded Revenge/Smashing Song of Praise - A remix and combination of the two boss-battle songs of the same name from Mother 3. It is used on the New Pork City stage. Mother 3 Love Theme - Taken from Mother 3, this song is a remix of the "Theme of Love" song from the Mother 3 and is the main theme of the game. It is used on the New Pork City stage. This song also plays during Lucas's Classic Mode credits. You Call This a Utopia?! - The background music of New Pork City from Mother 3, which is another remix of Porky's Theme. It is the theme of the New Pork City stage. Humoresque of a Little Dog - A whimsical song taken from Mother, the Drug Store theme from EarthBound, and in Porky's jukebox in Mother 3. It is used on the New Pork City stage. Snowman - A cover of a song that plays in every single EarthBound game. It is very similar to the Mother 3+ soundtrack's version (minus the chanting and added instrument after first loop). It is used on the New Pork City stage. This song also plays during Ness's Classic Mode credits. Mother (Melee) - An arrangement of Bein' Friends from Mother, taken directly from Melee. It is used on the Onett stage. Mother 2 (Melee) - An arrangement of recurring series theme Pollyanna (I Believe In You), taken directly from Melee. It is used on the Onett stage. Mother (EarthBound) Series Victory Theme - Lucas and Ness's victory theme. Taken from the title song of Mother. Hackers have found unused music in the game. This series has more cut out music than any other series. The EarthBound universe is once again represented in Super Smash Bros. 4. Both characters return, with Lucas returning as a downloadable fighter. Ness: a small-town boy from EarthBound who saves his world from an alien invasion. He returns as an unlockable character in the 3DS version, but back in starter form in the Wii U version. His appearance and proportions are closer to his original game; he has a thinner body and his clothing has much brighter colors. Some of his new alternate costumes also hold references to key characters from EarthBound. Overall, most of his moves are buffed, whether they are faster or stronger, making him more viable than the past three games. Interestingly, some of his custom moves are taken from Lucas's special moveset. Ness is one of the few veterans to be given new voice clips. Lucas: the timid protagonist of Mother 3 who fends off Porky's Pigmask Army. He returns as a downloadable character that is available for purchase starting from June 14th, 2015. Like Ness, he now has brighter-colored clothing, proper body proportions that match his debut title, and constantly wears a smile. And like Ness, some of his new alternate costumes make references to other important characters from Mother 3. Despite being slightly nerfed in transition from Brawl to SSB4, he has indirect buffs from the nerfs of other characters that counter him, which makes him play relatively better against the rest of the cast than in Brawl. Mii Brawlers wearing the Flying Man set next to a Mr. Saturn. Flying Man Outfit (DLC): this outfit is based on a Flying Man, a yellow-and-red birdman from EarthBound who resides in Magicant. Pixelated, two-dimensional Flying Men appear on the Magicant stage in the 3DS version as hazards, but one of the Flying Men was originally going to have a three-dimensional model. This was ultimately scrapped, but the assets used to make the 3D Flying Man were re-purposed for this outfit. The outfit was released with a corresponding hat in the Flying Man's likeness on July 31, 2015 as downloadable content. Mr. Saturn (throwing): a bow-wearing being from EarthBound. It can be picked up and thrown as a bouncy projectile that does enough shield damage to cause an instant shield break. Otherwise, Mr. Saturn walks harmlessly around the stage. Franklin Badge (status): a badge from the EarthBound series. It reflects projectile attacks when equipped. Starman: an extraterrestrial monster from Mother and EarthBound. It teleports around the stage and attacks opponents with PK Beam. Opponents can attack and ultimately launch the Starman if it accumulates enough damage. It does not attack the summoner. It also appears as an enemy in Smash Run. Jeff: a bespectacled friend and ally of Ness's from EarthBound. He attacks opponents with a bottle rocket. He does not harm the summoner. Mr. Saturn (Red): a bow-wearing being from EarthBound. The user can break an opponent's shield more easily. Franklin Badge (Red): a badge from the EarthBound series. The user starts battle with the badge equipped. Porky Minch (Green): Ness's neighbor and a major antagonist from EarthBound and Mother 3. The user steals an opponent's Tour Items. Ultimate Chimera (Red): a toothy monster from Mother 3. The user takes two fighters from the last opponent KO'd instead of just one. It will activate even if the user did not place first in the battle. Starman: an extraterrestrial monster from Mother and EarthBound. It teleports around the stage and attacks opponents with PK Beam. It also appears as an Assist Trophy. Its PK Beam can be reflected and absorbed only in Smash Run. Devil Car: a pyscho car from Mother and EarthBound. It attacks opponents by spinning doughnuts and running over them. It has a lot of HP and armor, making it difficult to launch. It cannot be grabbed. Flying Man: a yellow-and-red birdman from EarthBound. In Smash Tour, he aids the first player who bumps into him and travels along the board. He launches the next opponent he crosses paths with. He also appears in the 3DS version as a hazard on the Magicant stage. Magicant: staged in a dreamy realm from Mother and EarthBound. Its appearance primarily derives from Mother, though some elements are from EarthBound. A Flying Man will sometimes appear on the right side of the stage as a hazard. If a player touches one, he will fight along side them like an Assist Trophy. The Flying Man can be launched and defeated by other players. Should one be defeated, another Flying Man will spawn on the same right-side platform. After five Flying Men have been defeated, they will no longer appear in the rest of the match. Characters from EarthBound - the Mobile Sprout, Dungeon Man, and Sky Runner - cameo as platforms. Occasionally, a "rip" in sky will open in the background and shows moments from Mother and EarthBound. Many characters make cameo in this rip, including Ninten, the protagonist of Mother. This is one of the possible stages to appear in Level 5 of All-Star Mode as a home stage for Ness, who is also unlocked on this stage. Its Ω form is a floating platform like Final Destination. Onett: staged in Ness's hometown from EarthBound. Various vehicles drive on the road in the foreground and will hit grounded opponents. The colors of the stage are more pronounced than they were in Brawl and two mailboxes have been removed. It is one of the possible stages to appear in Level 3 of All-Star Mode as a home stage for Ness and it is large enough to accommodate 8-Player Smash. Its Ω form is columnar and staged on top of the Drug Store. Magicant / Eight Melodies (Mother): an arrangement of "Magicant" and "Eight Melodies" from Mother. It plays on Magicant and Onett. Onett Theme / Winters Theme: an arrangement of "Theme of Onett (from "Let the Adventure Begin")" from EarthBound and "Snowman" from Mother. It plays on Onett. Smiles and Tears: an arrangement of the ending theme "Smiles and Tears" from EarthBound. It plays on Magicant and Onett. Pollyanna (I Believe in You): an arrangement of "Pollyanna (I Believe in You)" from Mother similar to a vocalized arrangement of the same piece from the 1989 Mother album. This piece was abridged in Smash for Wii U. It plays on Onett. Onett: a medley of pieces from Mother, including "Bein' Friends", "Eight Melodies", and "MOTHER Earth". It plays on Onett. Snowman: an arrangement of "Snowman" from Mother similar to its arrangement from Mother 3. It plays on Onett. Porky's Theme: an arrangement of "His Highness' Theme" and "LOG-O-TYPE" from Mother 3. It plays on Onett. Unfounded Revenge / Smashing Song of Praise: an arrangement of the boss themes "Unfound Revenge" and "Smashing Song of Praise" from Mother 3. It plays on Onett. Mother 3 Love Theme: an arrangement of "Mother 3 Love Theme" and "Mom's Hometown" from Mother 3. It plays on Onett. Victory! Ness: a flourished arrangement of the first few bars of "MOTHER Earth" from Mother at a faster tempo. It is sourced from Brawl. Only one Trophy Box appears in the Wii U version. It is titled "Mother Series". The EarthBound/Mother universe returns in Super Smash Bros. Ultimate, curating the content from across the Smash series including all past music tracks, stages, items and Assist Trophies and introducing new elements such as a new item and music remixes. This is the first time since Melee where all of the Mother series fighters must be unlocked. Ness: The small-town boy from Onett returns as an unlockable fighter after being a starter in Super Smash Bros. for Wii U. He is significantly angrier and more expressive than his past appearances, even having his pupils grow when he gets hit. Many of his attacks and animations such as neutral air, up air, pummel, and PK Fire have been reworked to distinguish himself further from Lucas and now even feature new PSI-inspired visual effects. For his Final Smash, Paula and Poo now join him to perform PK Starstorm. Lucas: The timid boy from Tazmily Village returns as an unlockable fighter after being DLC in Smash 4. Like Ness he is significantly more expressive than his past appearances, even having his pupils grow when he gets hit. Several of his attacks and animations have been reworked such as his pummel and throws and now feature PSI-inspired visuals. For his Final Smash, Kumatora and Boney now join him to perform PK Starstorm. Jeff: One of Ness's party members in EarthBound, he launches one round of bottle rockets at the opponents. Cannot be KO’d. Starman - Extraterrestrial entities that first appeared in EarthBound Beginnings. They teleport around the stage and shoot PK Beams at opponents. The Starman can be KO'd. Franklin Badge - A badge of great importance that has appeared in all three Mother games. When equipped, it will instantly reflect projectiles. Mr. Saturn - An entity that first appeared in EarthBound. They do minimal damage when thrown, but can instantly break a full shield. Ramblin' Evil Mushroom - A minor enemy that first appeared in EarthBound; acts as a spraying weapon that reverses the opponent's controls. All EarthBound stages from previous titles return. Onett - Based on Ness's hometown in EarthBound. A drugstore and an arcade are seen in the foreground with various other buildings in the background. Cars occasionally pass by and can damage fighters in its path, including a car based on the Runaway Five’s bus. This stage is similar to its previous appearances, although the colors stand out more and some textures have been redone. Fourside - A metropolitan city that Ness and company visit in EarthBound. Its nightly appearance is based off of Moonside, an illusion created by the Mani Mani Statue. The Monotoli helicopter and the slippery-surfaced UFO make occasional appearances. The stage is darker than its Melee counterpart, and the colors stand out more. New Pork City - The last city Lucas and company visit in Mother 3, and also headquarters of Master Porky and the location of the final needle. The flying limo makes occasional appearances and the Ultimate Chimera also roams around the city, and fighters who hit it get instantly KO'd. The colors and streetlights now stand out more, and the city walls are now shaded purple. Magicant - Based off of a mystical realm in both EarthBound Beginnings and EarthBound that Ninten and Ness travel to, respectively. A rip in the sky reveals key moments from both titles. Elements from EarthBound make cameo appearances such as the octopus statue, Dr. Andonut’s Skyrunner, and the Dungeon Man. The Flying Men makes frequent appearances and, once one character allies with it, attacks other nearby fighters. The colors and textures are much more vibrant and detailed than its 3DS counterpart, and the background has been significantly updated to closer match the layout of EarthBound Beginnings's Magicant. All music tracks from the original Mother now labeled under EarthBound Beginnings. Arrangements and remixes unique to Ultimate. "Magicant": A synth-heavy rock remix of the Magicant theme, sampling some 8-bit sounds from the original game's version, from EarthBound Beginnings. "Fourside": A fast-paced rock and trumpet-centric remix of Fourside's theme, also known as "Because I Love You", that also incorporates the Eight Melodies from EarthBound. Arrangements and remixes returning from previous Smash games. "Pollyanna (I Believe In You)": A soft rock remix of "Pollyanna (I Believe in You)" from Earthbound Beginnings. Returns from Melee. "Bein' Friends": A medley of tracks from EarthBound Beginnings, including "Bein' Friends", the Eight Melodies, the title theme, and the "Enemy Encounter Theme". Returns from Melee, renamed from Mother in Melee and Onett in Smash 4. This track played in Ness's character trailer. "Fourside (Melee)": A techno-based remix of "Because I Love You" and the Eight Melodies from EarthBound. Returns from Melee, renamed from EarthBound. "Humoresque Of A Little Dog": The theme that plays in Drugstores and Department stores, from Earthbound Beginnings. Returns from Brawl. "Snowman": A remix of the theme of Snowman from EarthBound Beginnings. Returns from Brawl. "Mother 3 Love Theme": The theme that plays during the prologue, from Mother 3. Returns from Brawl. "Unfounded Revenge / Smashing Song of Praise": A remix of "Unfounded Revenge" and "Smashing Song of Praise" from Mother 3. Returns from Brawl. This track played in Lucas's character trailer. "You Call This A Utopia?! ": A remix of the theme played in New Pork City, "The Pig King's Playroom", and "Theme of King P", from Mother 3. Returns from Brawl. "Porky's Theme": An arrangement of "His Highness' Theme" and "LOG-O-TYPE" from Mother 3. Returns from Brawl. "Magicant (for 3DS / Wii U)": An arrangement of the theme from Magicant and the Eight Melodies, from EarthBound Beginnings. Returns from Smash 4. "Smiles and Tears": A remix the staff credits theme, "Smiles and Tears", from EarthBound. Returns from Smash 4. "Onett Theme / Winters Theme": A remix of the theme of Onett and the theme of Winters, from EarthBound. Returns from Smash for Wii U. "Victory! EarthBound Series": A new flourished, faster arrangement of the ending of "Eight Melodies" from EarthBound Beginnings. The overworld themes Pollyanna (I Believe In You) and Bein' Friends were from this game. Snowman, the theme that plays in the titular town, also originated from this game. Humouresque of a Little Dog, the recurring shop theme in the series, originated form this game. / Both versions of Magicant, along with the 8 melodies in Magicant/Eight Melodies, also originated from this game; both are themes that are played in the titular area. The special moves PK Fire, PK Freeze, PK Thunder, and PSI Magnet, first appeared in this game. Neither Ness or Lucas were able to learn these moves in their respective games however. Flying Men originate in this game, meant to represent the courage of the protagonist. They appear on Magicant as a stage hazard, and serve as a DLC alternate costume for the Mii Brawler. Ness, the main protagonist of the game, is a playable character in all of the Smash Bros games to date. Several of Ness's costumes also originate from this game. Mr. Saturns, docile creatures who reside in their namesake valley, make their first appearance in EarthBound. Onett, Ness's hometown, has appeared in every Smash game since Melee. Some elements of EarthBound's Magicant appears in Magicant, such as the Sky Runner and the Octopus statue. Jeff, one of Ness's party members, is an assist trophy in Smash. His bottle rockets also originate from this game. Ness himself, his party members, two of the Runaway Five members, Frankystein Mark II (a mini-boss in the game), a Mr. Saturn, and three UFOs can be seen in Ness's congratulations screen from Super Smash Bros.
EarthBound itself is one of the playable Masterpieces in Brawl (Japan only) and Smash 4. Lucas, the main protagonist of the game, has been a playable character since Brawl and was planned in Melee to replace Ness. Some of his costumes originate from this game, too. Ness's white costume is based off of Fuel, a character from this game. New Pork City, the final area of the game and the biggest city on the Nowhere Islands, is a playable stage in Brawl and Ultimate. The Ultimate Chimera, a hazard on this stage, is an invincible enemy that originates from this game, too. Porky's Theme incorporates may themes from this game that relate to the Pig Mask Army and Porky Minch. Fierce Pork Trooper, and the latter plays during the fight with the Forlorn Junk Heap. Mother 3 Love Theme is the main theme of this game and is played during many cutscenes. This rendition also includes the theme of pre-modernized Tazmily Village. The Porky Statue also originates from this game. It's a statue that can only be destroyed by either the New Year Eve's Bomb or, in rare cases, PK Flash. When Lucas does PK Starstorm in Ultimate, Kumatora and Boney, two of his party members, appear alongside him. The copyright for Shigesato Itoi/Ape Inc. isn't listed in the title screen of Super Smash Bros. and the back boxart for Super Smash Bros. for Nintendo 3DS, possibly due to Ness being an unlockable fighter in both games. Additionally, the copyright isn't listed in the Super Smash Bros. for Wii U eShop copyright listings without including the page of DLC. EarthBound, Final Fantasy, and Persona are the only universes that do not have a character from their original installment playable in Smash Bros. Subsequently, Earthbound is the only Nintendo series with this distinction. EarthBound is one of four character-based series not to have a home stage for a fighter in the installment it was first included in, the other three being F-Zero, Fire Emblem, and R.O.B. The EarthBound universe is one of two universes introduced in the original Super Smash Bros. to have no playable characters appear in the World of Light trailer, the other being Yoshi. Super Smash Bros. Ultimate marks the first time both Earthbound characters share the same availability. Super Smash Bros. Ultimate marks the first time where Mother is retitled EarthBound Beginnings via music source. This is due to Mother making its international debut on Wii U Virtual Console in 2015 as EarthBound Beginnings. The stage prefix for Magicant, however, is simply listed as EarthBound rather than EarthBound Beginnings, despite the stage being heavily based on its appearance in the latter game. Earthbound is the only Smash 64 franchise to not feature playable characters in any of the posters containing newcomers debuted in Super Smash Bros. 4. This applied to the Yoshi series prior to DLC.